IB stands for International Baccalaureate. It is an alternative to AP, or advanced placement that is more prevalent in American public schools. However IB, as suggested by the name, is more internationally recognized. Over 4000 schools from around the world follow the IB curriculum, whereas AP was created by College Board and is primarily active in the United States and Canada. 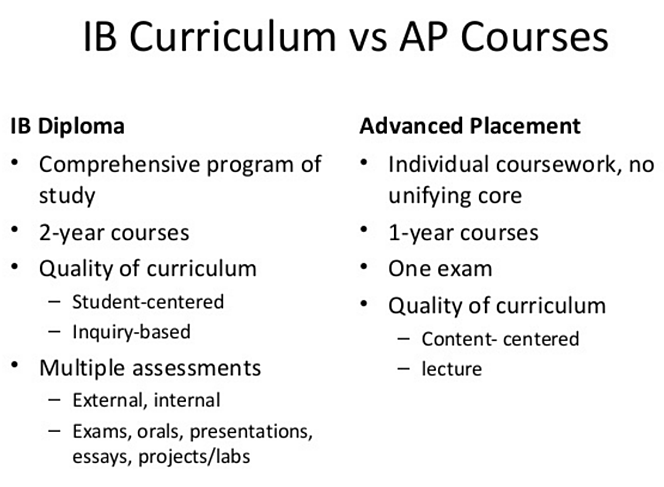 As more and more schools begin to offer the IB curriculum, parents and students should be aware of the differences between the two programs. In this blog, I will do my best to sum up those differences. A tangent: What’s it like going to the number one high school in America? In case you’re curious-- it was not very fancy. The building itself used to be an elementary school before it was converted, hence it was small. My class was 100 people and there were a total of 400 students in the school. To enroll, each prospective student had to take a test and if you made a certain cutoff, your name was put into a lottery and from a bin of hundreds of names, one hundred were chosen. So not only did you have to demonstrate caliber, you also had to be lucky. There were also no school sports, meaning no football, basketball, swimming, etc. To do sports, students had to go through their home school, that is their district school. The closest thing to sports was robotics. The second closest was Science Olympiad. I was on the robotics team for three years and Science Olympiad for all four. There was no such thing as homecoming or dances, really. We did have prom but it was not a big affair as the week after we would all have to file into the cafeteria and take our IB exams. Don’t get me wrong. I had a lot of fun at IA, possibly more fun than I had at college. But it was still a high-pressure environment, filled with a bunch of competitive kids. Now back to those differences. The IB program is a diploma program, meaning that at the end of high school, students not only get a high school diploma but also an IB diploma. The appeal of this, for me at least, was not high. I have yet to take out my IB diploma and show people. I actually have no idea where the physical diploma is. But the idea behind the diploma is the core of the IB program. All the IB coursework is interconnected. For my school, we were required to take 6 IBs, one of which had to be a foreign language, two of which had to be a science and one of which had to be math. The goal of the IB is to give the student a comprehensive education. The AP program, on the other hand, has no unifying core. A student can sign up for as many or as few AP courses as he/she wants. The more AP courses you take, the more demanding your schedule becomes, but each course lasts 1 year as opposed to 2 for the IB. There are also no set requirements for how many AP’s a student should take. Each AP is its own individual course and can stand-alone. Whereas at my IB school, all the teachers were expected to work together to create curriculums that reinforced one another (i.e. there was no point in teaching calculus based physics to students who were in math SL and had not yet gotten to calculus), AP teachers make no such promises. If you are taking AP physics C, you better know calculus beforehand, or the year will be extremely difficult. Currently, College Board offers 37 different AP courses. Some topics like biology or chemistry have only 1 course dedicated to them. But physics alone has 4 different APs and math has 2. An aside: my gym class wasn’t even called gym. It was called Adventures Challenge. Instead of dodge ball, we did obstacle courses in body harnesses. We talked about teamwork. In terms of actual physical fitness, the class was a joke but it did bring a group of diverse kids together over problem solving games. Because there is no underlying structure to the AP, you can really take as many as you want and I have heard some students taking upwards of 14 AP’s because each AP boils down to a test. For students who go to schools that only offer AP, taking as many AP’s is the norm because it can show a certain set of schools (probably the Ivies), how high achieving the students are. Since all top colleges demand that the applicants show rigor in their coursework, some students will take as many AP’s as they can, to prove that they can (not the best reason, but oh well.) The core of the AP program boils down to one test, taken at the end of the academic year, usually May. You don’t even have to take an AP class to take the test. You can simply sign up for the test and show up. So really the AP program is not so much a curriculum as it is a tougher (much tougher) version of the SAT subject tests. But IB’s are class based. You have to take both class AND test to qualify for the diploma. Taking 14 IBs is unheard of. Can you imagine? Taking 14 two yearlong courses? First you would run out of topics to study and second you would probably perish from stress. I also don’t even know a school that offers that many IBs. If you are at a school that doesn’t offer many APs and you really are gunning for a top school, I suggest that you study for APs independently. Self-studying looks great on your resume too! It shows that you REALLY challenged yourself. No college will hold the academic level of your school against you but if you demonstrate self-sufficiency, colleges love that. Personally, I took the AP biology test without taking a class. To learn the material, I just spent every Saturday morning reading this. I did this because I wanted to learn more biology but didn’t want to dedicated 2 years of coursework to it. I liked chem and physics and math more, so my course load was already full. Another aside: yes, I was a complete nerd. But I was not alone. To find more like me, you only need to go on collegeconfidential.com. There you will find thousands of students posting their stats and colleges that they are aiming for. Then other students will comment on their likelihood of being admitting. I, along with lots of my IA friends, spent our free time browsing this site, comparing our stats to that of the others and figuring out our own likelihoods. Then at lunch, we conferenced about our findings. In hindsight, we were an insane bunch of kids. As I have said before, each AP course comes down to one test. The College Board does not care what you got in the class; it only cares about how you did on the exam. The exams range from two to three hours and are broken up into two parts. The first part primarily consists of multiple-choice answers. The second part is free response. Certain APs, like History or English, will require you to write long essays, while the science and math APs may require show your-work kind of problems. But the general idea behind each AP is after you take the test, you are done, you will not have to sit down for that subject area again. The IB exam schedule looks something like this. Just looking at this schedule makes me wonder how I ever did it…and then later thought it wasn’t actually that bad. This schedule is set by an international committee. For three weeks at the end of senior year, each IB student will take 18 exams that cover the 6 subjects of their choice. This is because each IB subject has three papers (aka tests), spread out over the 3 weeks. So if you take Math HL like I did, your first exam is the morning of May 12th, then the second exam is in the afternoon of 13th, then the third exam is in the afternoon of the 21st. Now factor in all of your other 5 subjects. The three papers of each subject cover different topics but do not necessarily increase in difficulty. The first two might cover the foundational topics, whereas the third covers optional topics that your IB teacher (hopefully) should have gone over in class. The major bummer about the IB is the examination schedule. It is at the end of senior year and all you want to do is have fun. But no. You must take 18 exams in a row. You may not be done with one subject until 3 weeks later. 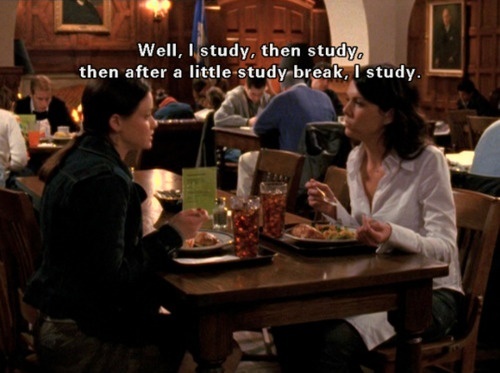 You may still be studying throughout the 3 weeks (I was. IB French was not my strength. Nor was IB history.) For 3 weeks, morning and afternoon, you are in the same room with the same group of kids. You also can’t staple any of your pages. You have to use this plastic toggle that easily comes apart. I have no idea how I got through that. But the moment I finished my last exam, I went home and slept for two days. Grading for the exams is slightly different. The AP goes from a 1 to 5 scale, the IB a 1 to 7. 5 is the highest AP score whereas 7 is the highest IB. The AP subject score is based on one test, the IB on all three papers (so you can’t bomb one and hope to be okay.) Because the AP is based on an individual subject, each subject score is assessed by itself. To earn the IB diploma, you need at least 24 points from all of your tests combined. If you do the math, that means you need to earn at least a 4 on all 6 subjects tests. Earning a 7 was not incredibly difficult but it was difficult enough. In our class of a hundred, less than five were able to score a 7 on the IB Chem HL exam. But those who did earned a place on our chemistry teacher’s wall of extraordinary chemists. The AP focuses on what. The IB focuses on how. From what I recall, the AP Biology test was essentially recall. I had to read a certain amount of materials and then I had to rewrite it on the page. There was thinking involved of course but very little critical thinking, that is being given a completely new set of information and then asked to analyze it. There was none of that. There was, for instance, infer what mode of inheritance this gene is from the pedigree tree, but then nothing beyond. Other AP exams such as chemistry or physics or math do involve more critical thinking as the student is required to solve individual problems and show work. AP English and history also require you to write essays on the spot. However, there are also a number of test prep companies out that that specifically cater to the AP and pump out thousands of mock questions at a time. Many of my AP friends studied from these books and found that the actual test mirrored versions of the ones they took for practice. A bummer about the IB is that there are no test prep books on them. This is probably because the IB is not so much test based as course based. The IB student relies heavily on the IB teacher. IB teachers go through extensive training to understand the curriculum of their subject inside and out. Teachers are given the practice materials and old exams. Students might be able to torrent old exams online but it is actually very difficult (I know. I tried.) As a result each IB exam feels familiar but not entirely predictable. I might have recognized 30% of the question in terms of content but then had to stitch together the latter 70% on the test day. Breadth of knowledge is important for AP but breadth and depth of knowledge is important for the IB. Remember when I said that AP is short term and IB is long term? This is so true that I want to double back and give you more details. If you an AP student, after the test you are DONE. Completely. It is a one test, one score system. College board does not factor in what you got in the care nor does college board care. If you are an IB student, however, you are not just looking at 18 exams aad 2 years of heavy coursework. The IB also requires that you take that semester of philosophy (aptly named the theory of knowledge or TOK) and write a 1600 word TOK essay on topics like to what extent are areas of knowledge shaped by their past, or evaluate whether there is such a thing as a neutral question, or to what extent do you believe that facts and theories can overlap. In addition to TOK and the essay, IB students are required to do a creative, activity, service project (CAS). This could either be 50 hours of community service or a creative endeavor like starting and running your own club or going on an extended summer trip to help an impoverished country build schools. You get the point. In addition to CAS and TOK, IB students are finally required to write a 4000 word extended essay. This is like a mini high school thesis on a topic of your choice. I chose physics and spent a summer studying 2D metal frameworks at Baylor University. Then I wrote up my results. Usually the student is paired with a teacher-mentor who suggests possible projects and then the student spends their junior summer researching and writing. Now that I am writing my PhD dissertation, I look back at the 4000-word requirement and have to laugh. I was freaking out at the time but now I wish I could only write 4000 words and be done. Nevertheless, for a high school student, a 4000-word essay is still very intimidating, especially if it is based on an original idea! So to sum the key differences, I thought what better way than a table slash bulleted list slash bulleted list table! The big question, if I went back would I still have done IB? What I liked most about the IB was that I didn’t have to think much about what classes I needed to take to stand out for colleges. Many AP students felt that they needed to take Calc BC or physics C 1 and 2, etc, etc. I didn’t have to fret about those choices because I could just pick the IB physics HL track and be set coursework wise for the next 2 years. Then I had head space for other things. The IB’s level of comprehensive learning is still truly astounding for me. I still remember everything that my IB physics teacher taught me and use some of the same methods to teach my current students about MCAT physics. My IB chemistry teacher was also phenomenal and from him, I was able to gain a much deeper understanding of general chemistry that could not even be matched at the college I eventually went to. Recently, I have even taken out my IB math notes for my graduate level statistic class. Perusing through my notes, I still cannot believe that I was doing this stuff as a high schooler. For me at least, the debate between the AP and the IB is not really a debate as it is not really a fair comparison. The AP tests individual topics. The IB is an entire curriculum. By signing up for the IB, you are signing up for a different way of learning. Yes, there are tests, but there is much more beyond these tests. By the time an IB student gets to the tests, he or she will have already become a well-rounded student. One thing I want to re-emphasize is that the AP exams are great for students who really want to highlight a knowledge area that is not offered at their school. In schools that don’t offer any APs, a gifted student can still stand out by signing up for an AP exam in another district, whereas no student can take the IB without the proper set of teachers and resources.